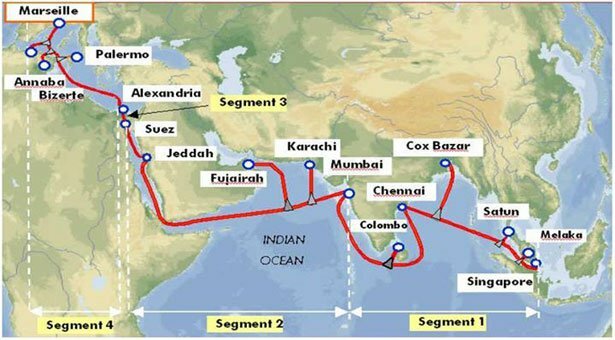 Monday, August 7th 2017 – Pakistan suffered severe nationwide disruption of internet services this past weekend, due to a fault on the India-Middle East-Western Europe (IMEWE) submarine cable system near Jeddah, Saudi Arabia. The situation presented a pressing concern to ISPs because the IMEWE carries a significant amount of Pakistani bandwidth. The crisis was exacerbated due to the fact that the South East Asia-Middle East-Western Europe 4 (SEAMEWE 4) and TransWorld 1 (TW 1) cables were already offline at the time, having been undergoing repairs for the past month. Major ISPs, including PTCL and Nayatel issued notices to customers regarding the degradation of internet services, giving no resolution time frame. However, PTCL was able to resolve the issue in record time: within 36 hours; and Internet services throughout the country have been fully restored. This was notably due to the commencement of operations of the new low latency Asia-Africa-Europe cable (AAE 1). The 25,000km long cable now forms the largest submarine cable system in the world, one that was built over a decade as part of China’s One Belt, One Road (OBOR) initiative. The successful divergence of bandwidth to the new cable highlights the increasing need for alternate routes for Pakistan’s internet traffic as well as the relevance of prevailing discourse and debates pertaining to them. One project that warrants exploration in this regard is the new backbone fibre optic cable that has been proposed under the China Pakistan Economic Corridor (CPEC) initiative. The new state of the art terrestrial cable between Pakistan and China would create a back route which alleviates the possible risks of disruption associated with Pakistan’s existing undersea fibre optic cables, which are prone to damage and much more difficult to repair and maintain. It would also increase the country’s capacity to handle bandwidth demand. However, although dominant discourse posits that such a venture would benefit the state in terms of enhanced security and revenue, perhaps there is a need to go beyond a purely techno-social understanding of the project. While the project may indeed improve the reliability, speed and penetration of internet in the country, more political issues such as that of censorship and surveillance need to be accounted for as they have almost an equal stake in terms of determining digital rights and internet access at an individual level. Internet Freedom remains limited in Pakistan, which has been ranked amongst the 10 worst countries in terms of internet freedom according to an index prepared by the DC-based Freedom House. The Prevention of Electronic Crimes Act that was enacted in August 2016 as well as the use of software such as FinFisher and Netsweeper are also indicative of the dangerous path the nation is treading in terms of the right to information and the freedom of expression. In a similar vein, China’s model of internet regulation is premised upon it’s ‘great firewall’ which has a sophisticated monitoring system that blocks a list of foreign websites, setting a dangerous international precedent for censorship and surveillance. A bilateral project with China inadvertently threatens the right to privacy and free speech as it presents the opportunity for cooperation between both states in surveillance and censorship endeavors. A greater reliance on cable systems controlled by Chinese companies also increases the potential for Chinese interception of critical financial and security information. In conclusion, although the recent internet outage demonstrates that there is a dire need for solutions that increase the technical infrastructure and capacity of Pakistan to bear the weight of rapidly increasing bandwidth demand, the Ministry of IT and Telecom and the Pakistan Telecommunication Authority need to adopt a more holistic approach to the issue of internet access and freedom in the country. For inquiries, contact Saleha Zahid on saleha@bolobhi.org. One Response to "Bolo Bhi Statement on the Recent Internet Disruption in Pakistan"